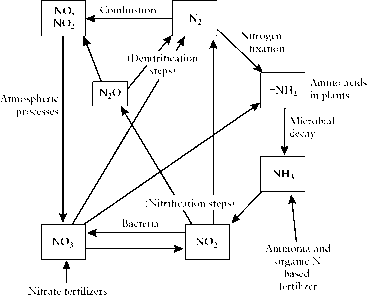 Nitrogen exists in nature in several oxidation states: N(-III) as in NH3, NH+, and various organic compounds; N(III) in nitrites, NO- , and N(V) in nitrates, NO- as well as N(0) in N2 in addition to other formal oxidation states in oxides of which nitrous oxide (N2O), nitric oxide (NO), and nitrogen dioxide (NO2), are most important environmentally. The elemental form N2 contains a triple bond with a large bond energy (946kJ/mol). Consequently, reactions that require the N—N bond to be broken are likely to take place with difficulty, even if the overall energy change of the reaction is favorable. As a result, N2 is relatively inert. Some of its most important environmental reactions are produced by microorganisms, which can provide a reaction mechanism of low activation energy to convert N2 to ammonia and amines. These reactions depend on pH, and the equilibrium composition of a nitrogenous system depends on this as well as on the redox potential pE of the system (Section 9.4). Nitrite has a comparatively narrow range of pE over which it can exist at significant concentrations (Figure 10-5); most commonly the stable forms of nitrogen are NH+ or ammonia in reducing environments, and NO-in oxidizing ones. At pH ranges near neutrality, the NO2- stability region lies near pE 6.5. The essential features of the nitrogen cycle are shown in Figure 10-6. There are several processes of importance. FIGURE 10-5 The relative concentrations of the nitrogen species in solution as a function of pE at pH 7. FIGURE 10-6 The nitrogen cycle. Terms are defined later in the text. both iron and molybdenum take part. The process leads to amine nitrogen, which is incorporated into amino acids in the plant. Plants generally, however, absorb nitrogen from the soil in the form of the nitrate ion. Other natural fixation processes—for example, formation of nitrogen oxides in the atmosphere by lightning discharges—also contribute to a lesser degree. Much nitrogen is fixed industrially, as discussed later. Sodium nitrate and nitrite (the latter often produced from nitrate in situ) are common additives in cured meats, where they act to prevent the growth of bacteria, but nitrite is also added to produce flavor and an attractive color through the formation of nitrosylmyoglobin. Concerns about the risks from nitrate and nitrite have led to reductions in their use. Source: Data from P. M.Vitousek, J. D. Aber, R. W. Howarth, G. E. Likens, P. A. Matson, D. W. Schindler, W. H. Schlesinger, and D. G. Tilman, Ecol. Appl, 7, 737 (1997). Some nitrogen is returned to the atmosphere as N20 generated bacterially in soils. Nitrous oxide is comparatively inert, but it is rapidly destroyed by processes that are not entirely clear. It can be photolyzed to N2 at high altitudes, where radiation exists at wavelengths short enough to be absorbed by N20 (see Chapter 5), but it does not seem likely that this reaction can be responsible for the low N20 levels usual at low altitudes. Other processes for N20 removal must exist at or near the earth's surface. It is a greenhouse gas, and its concentration in the atmosphere has been increasing recently by a few tenths of a percent per year from the effects of fertilizers, land clearing, and industrial processes, although the details are not well understood. Some ammonia is also released naturally from decay of organic materials and is present in air either as NH3 gas or as an ammonium salt aerosol. These are removed from the atmosphere in rain. Ammonia is the main basic material in the atmosphere. Table 10-3 gives estimates of the amount of nitrogen contained in the various environmental reservoirs. The atmosphere contains most of the earth's nitrogen as N2. Inputs of "fixed" nitrogen, oxidized or reduced forms, are given in Table 10-4. There are widely varying estimates for some of these quantities; for example, estimates of nitrogen oxides produced by lightning discharges vary from 2 to 20 x 1015 g of N per year, and fossil fuel combustion from 14 to 28 x 1015 g of N per year.9 As can be seen from these data, anthropogenic inputs exceed natural ones. The cycle is unbalanced as the amount of fixed nitrogen is continually increasing. 9See, for example, G. Brasseur, J. J. 0rlando, and G. S. Tyndall, eds., Atmospheric Chemistry and Global Change, 0xford University Press, 0xford, U.K., 1999, Chapter 5, for some of these estimates. Source: Data From D. A. Jaffe, in Global Biogeochemical Cycles, S. S. Butcher, R. J. Charlson, G. H. Orians, and G. V. Wolfe, eds., Academic Press, San Diego, CA, 1992. Fixed nitrogen includes gaseous compounds such as NO*, N2O and NH3 as well as nitrates and so on. NO* released to the atmosphere annually amounts to about 64 x 1012g of N, about half from natural sources; NH3 is about 53 x 1012g of N, over half of which has an anthropogenic origin, and N2O, about 15 x 1012 g of N. There is some interconversion of these species as one is oxidized or reduced to another. lated by plants as the nitrate ion, the original source of the nitrogen does not affect the plant. Rather, choice of the form a fertilizer should take is based on the rate of release of NO", extent of leaching (which results in waste and ultimately water pollution), and other economic factors. Estimates are that half of the nitrogen applied as fertilizer is never taken up by plants but enters into runoff water. Consequently, fertilizer production and cost are closely linked to the supply of these fossil fuels. Ammonia is the starting material for most other industrial nitrogen compounds; for example, nitrates are produced through reactions that include oxidation of ammonia by air in the presence of a platinum catalyst. Oxides of nitrogen in the atmosphere are a cause of concern with respect to air pollution problems, as discussed in Chapter 5. The main compounds of concern are NO and NO2, which are by-products of combustion processes. They are formed from the reaction of N2 in the air with O2. The primary product is NO, but some NO2 is produced as well. Production of nitrogen oxides (often called NO*) is directly related to the temperature in the combustion zone of a furnace or engine and can be reduced by operating at lower temperatures. This generally reduces the efficiency of the device, however. Reduction of the amount of excess air in the combustion chamber also will reduce NO* emission, but at the expense of an increase in the amount of incompletely burned fuel. A two-stage combustion, the first at high temperature with an air deficiency, followed by completion of the combustion at a lower temperature, can be quite effective in reducing NO* emission. 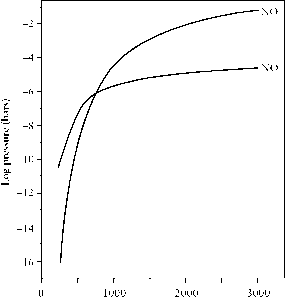 Figure 10-7 shows NO* equilibrium concentrations as a function of temperature at one particular fuel/air ratio, equivalent to a 20% excess of oxygen. The reaction between oxygen and nitrogen to form the oxides is kinetically complex, requiring first the reaction of oxygen with another molecule to generate oxygen atoms, and reaches equilibrium in a finite time only at high temperatures. Once formed, the NO and NO2 concentrations will by "frozen in" when the temperature drops to a value at which the rate becomes insignificant. 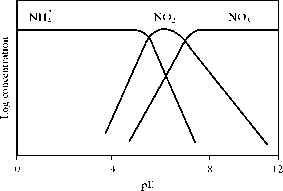 FIGURE 10-7 Equilibrium pressures of NO and NO2 in air with a 20% excess of oxygen over fuel. Redrawn from S. S. Butcher and R. J. Charleson, An Introduction to Air Chemistry, Copyright © 1972. Used by permission of Academic Press. The nitrite salts formed in a basic solution can be oxidized to nitrate. 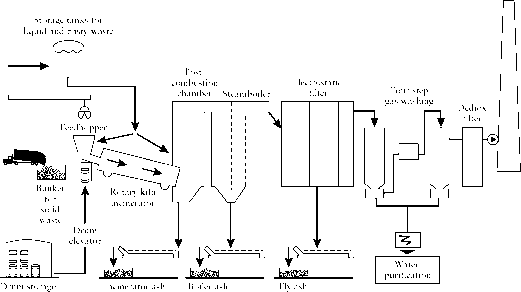 This process, however, requires equimolar amounts of both NO and NO2 in the gas stream, or recycling of the excess. Only a few such systems are in use , but up to 80% removal of NO* is claimed for a 1000-MW coal-fired plant in Japan. The nitrogen cycle, like the carbon cycle, is not balanced because of human activities (Table 10-4). Although less well known than the carbon dioxide problem, the increase in fixed nitrogen compounds can have comparably significant environmental effects. Industrial nitrogen fixation plays a major role in this imbalance, but also involved is release of fixed nitrogen from soils and biomass from land clearing and wetland draining, and burning of biomass and fossil fuels. "Natural'' fixation has increased through planting of more leguminous and other plant crops. Increased fixed nitrogen in soils increases plant growth, which in fact is helpful regarding the carbon dioxide problem, as more carbon is sequestered in biomass. However, this is coupled with more release of nitrous oxide to the atmosphere in denitrification processes as a consequence of more nitrogen compounds available to soil bacteria. Atmospheric nitrogen compounds contribute to acid rain and to soil acidity; this, along with the acidity increase that results from the bacterial activity, encourages the solubilization of other elements. ocean, where nitrogen is normally limiting and additional input can lead to harmful algal blooms and damage to important marine life. Consequences of the nitrogen overload are most obvious in northern Europe and to a lesser extent in the United States, where fertilizer use has been highest and nitrogen inputs to forests and freshwater systems have increased to 10-20 times the natural level.